Solving your network problems requires strong visibility and adequate monitoring of your network, otherwise, you’re stumbling around blindly. Your security and network monitoring tools are only as good as your visibility, and you need to be able to see the ENTIRE network. The visibility adaptation layer is an important driving force in cutting operating costs and improving ROI, enabling maximal cost-effectiveness in how you manage and secure your resources. By implementing our full range of products, you can enhance this layer so that it offers not only critical visibility but the capability to adapt traffic for each required service. The visibility adaptation layer adjusts and modifies traffic for each required service as needed, by blocking, filtering, aggregating, replicating, stripping, tunneling, load balancing and more—at up to 100Gb rates. Our products can also apply other traffic processing capabilities, such as de-duplication to offload advanced processing capabilities to the visibility layer. At the lowest level – the Visibility access points level – Niagara Networks components are designed to work best together as well as initially being capable of acting as self-contained and independent modules within the network topology. Each access point, whether serviced by one of our network taps, network packet brokers (NPBs), or network bypass switches, is a seamless yet necessary part of the overall design. At the same time, hybrid components as well modules that are made up of specific combinations of network visibility layer enhancing devices are employed as specific building blocks for key network links and access points. An example of this would be a combination of NPBs and bypass switches. In another example, the network bypass switch can even be used as a network tap. In any and all cases, however, the correct placement of the individual network monitoring tools (or groups thereof) is the key and essential ingredient for an effective integrated network performance. At the higher level – the Services level – Niagara Networks offers the right balance of tools and modules – specifically the N2 series and the Niagara Visibility Controller (NVC). The scenarios and tasks they are meant to handle range from the simplest, straightforward requirements, to the most complex of network topologies. This provides for full, pervasive network visibility that is so mission critical in the network’s performance, its management and troubleshooting requirements, and particularly in ensuring the maximum network security muscle for the enterprise. The two levels of Niagara Networks offerings (the Services and the Visibility layers) and the solutions they provide, make for a stable and secure enterprise network. Connect to all elements in the network for complete “pervasive” visibility. Tap into your network with passive or active Taps. A wide range of network monitoring tool connectors and fiber types are supported. Passive Taps are based on an optical splitter so that the tapped network point and appliance are always connected. Active Taps are based on optical or copper relay, ensuring full physical signal regeneration at the tapped network point. Our signature product based on BypassP2 offers a bypass segment comprising of two network ports and two appliance ports. Double-protection bypass technology offers a failsafe optical or copper relay on network monitoring tool ports and a user-configurable heartbeat generated packet on appliance ports. Use heartbeat technology to automatically detect appliance failure and failover to the network, and back to the appliance, based on the appliance’s availability. BypassP2 is available in multiple size bypass segments, supporting a range of network interfaces up to 100Gb. All products based on BypassP2 can be user-configured as active taps. Niagara’s signature FixedBroker is a high density, high-performance, packet broker series that packs a lot of power into a compact, 1U form factor. FixedBroker supports non-blocking chip‑based switching fabric and a range of network interfaces up to 100Gb for all your network and network monitoring tool needs. Some products offer multiple network interface types for easy aggregation and stacking. All FixedBroker products include Niagara’s pioneering Packet Heartbeat and FabricFlow technology for an exhaustive built-in set of packet broker features, including replication, aggregation, filtering, load balancing and more. Our newest series of products—the N2 series—provides a single, multi-purpose platform that covers all of the visibility adaptation scenarios in your network. The N2 series can be populated with a wide range of high density, high versatility, processor-accelerated modules. Its modular design supports advanced FabricFlow technology, capabilities and features including network Tap, bypass, packet broker, and packet processing applications. The N2 series is available in both a 1U and 2U form factors. A unified management layer for all of the products that comprise the visibility layer, the Niagara Visibility Controller creates a virtual switching fabric and facilitates effective resource allocation. It also makes it intuitive and easy to set up complete monitoring of your network monitoring tools and give you an overview of the visibility adaptation layer’s health and status. The Niagara Visibility Controller may be used to provision, enable and enforce new, dynamic, on-demand services. 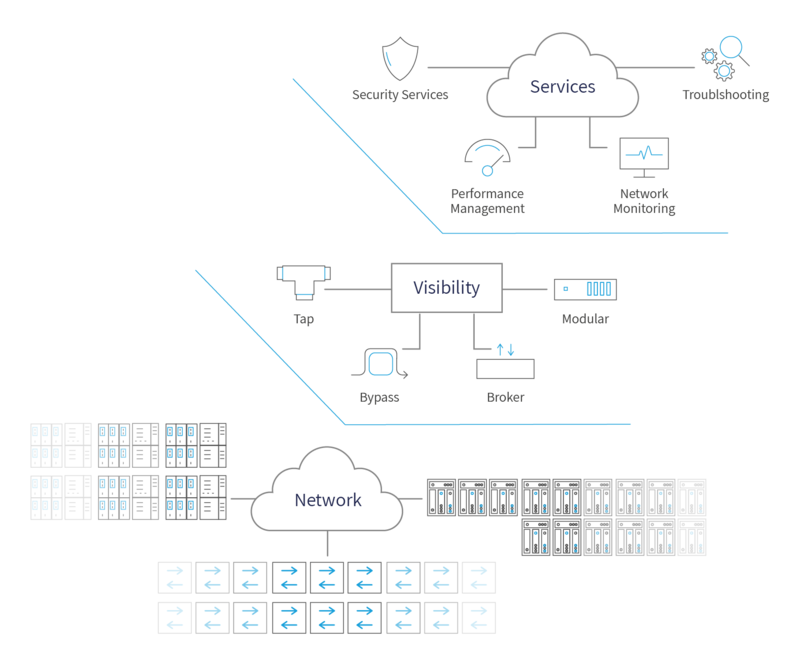 The pervasive visibility solutions proposed by Niagara Networks are comprised of two levels of mechanisms that work together to provide you with the means to maintain a constant and comprehensive control over the network and its performance. These two levels are hardware components for bearing the brunt of the work to achieve full network visibility, and software mechanisms built into our software defined network (SDN) based management system. Global and complete network visibility is achieved by understanding the need to locate possible network blind spots and failure points and design the networking infrastructure to include the network monitoring tools to eliminate, or at least decrease the number of visibility gaps. In order to do this, strategically allocating and positioning network taps, network bypasses, and network packet brokers (NPBs) will create a visibility adaptation layer that covers all possible network access points – both physical and virtual. The correct combination of network packet brokers (NPBs) and taps can provide an additional level of functionality. A packet broker that is placed between the network tap and security or monitoring tools can reroute traffic intelligently by preset port mapping schemas. The correct combination of network packet brokers and inline network bypasses that are attached to network inspection devices may detect that there are imminent traffic issues, and the NPB can then intervene to reroute the traffic to keep it flowing. In addition to the standard elementary H/W devices (taps, switches, etc.) that support network monitoring tools, Niagara Network’s box of versatile products includes the new N2 Series. This hardware platform offers even more advanced capabilities for the network visibility adaptation layer. The usefulness of your network monitoring tools (and thereby the capability of the entire network security) is largely dependent on the availability of network visibility at the network managers’ and IT staff level. This is the Services level where Niagara Networks’ cutting-edge monitoring and management product, the Niagara Visibility Controller (NVC), shows its muscle. NVC GUI offers the precise multiple views, and correct network management leverage, to oversee and make sure everything runs correctly. It combines with the network Services part of the visibility adaptation layer to deal with three key areas: visibility, efficiency, availability. Unimpeded network system performance is critical to meet all business needs, and pervasive network visibility in the form of the network visibility adaptation layer is a key factor for guaranteeing this.